A relentless alien bounty hunter encloses a Texas town under a dome to isolate, hunt, and kill its prey in “the ultimate horror novel” (The Philadelphia Inquirer). Ever since the copper mine closed, the West Texas desert hellholes of Inferno and Bordertown have been slowly dying. Snake River isn’t the only thing that divides them. Racism, gang wars, and anti-Mexican sentiment have turned the sun-scorched flatlands into a powder keg. If anything can unite them for now, at least in awe and wonder, it’s the UFO that comes soaring out of the clouds like a flaming locomotive. In the wake of the crash, a young alien named Daufin has arrived, too. A fugitive who has taken the form of a human, she knows the terror that awaits the inhabitants of this planet—because it is looking for her. When Stinger, the monstrous alien bounty hunter, arrives, it’s with a destructive fury and a devious plan to find Daufin—by entombing the residents in an impenetrable and inescapable dome. A relentless killing machine, Stinger has an infinite capacity for death and destruction. And over the next twenty-four hours, this town is going to bleed and burn. Now, the few remaining survivors must come together to protect Daufin, themselves, and the world beyond from total annihilation. From the New York Times–bestselling and Bram Stoker Award–winning author of Swan Song, Stinger was called “one of the best suspense novels of recent years” by the Science Fiction Chronicle. This is a fun and possibly seminal work, which has elements that we later see in other, more famous work by other writers. I realize that at the time it was written, this writer was relatively unknown. It is an early work. There probably was not a big budget for proof readers or editors. However, the edition I purchased was a book club edition, and one would think that by the time a book gets to that level, someone would at least have been able to go back and fix the glaringly obvious mistakes the writer made in areas where he perhaps had no expertise at the time. What bothered me? "...a gentle horse that [they] had raised from a pony." This is kind of like saying a wolf raised from a fox. Horses are not ponies; and the young of both is called a foal, or colt (male) or filly (female). Later, the "withers", the area of shoulder where the mane meets the back, is set at the back of a saddle in one sentence. This may not seem like a big deal, but for the millions of readers who know better, it really jars us out of our suspension of disbelief and entirely out of the book altogether - which is why there are editors and proofreaders. I'd hope SOMEONE would have corrected this for Mr. McCammon, and no one did. A big shame, worse than letting typos slip by. That said, this is a rollicking, sci-fi horror book with young protagonists...always fun. I won't spoil any of it by mentioning specific plot points. It is a product of its time and more modern sci fi thinking may cause the reader to think of a few plot holes or solutions the characters miss...but honestly, it is a fun read that kept me turning the pages. Always good to read a Robert McCammon tale and this is no exception! Good guys, bad guys and most of all Stinger, a true monster. It would be easy to pick the logistics apart but a story's main job is to entertain and this on does just that. A small dying Texas town, a couple of gangs, a teacher and his family and an unassuming alien that just wants to go home...but not ET-like. Far from it and the Stinger is a bounty hunter that looks like a scorpion but MUCH larger and has other plans for the homesick alien and the people that are trying to help it! Mr McCammon wrote many very different books and I loved several of them. But choosing this one was a mistake on my part. Despite plenty of action I found it quite boring and I ended up skipping whole paragraphs in order to finish it. Let me explain why. First 40% of book is essentially an introduction familiarizing reader with the place and with multiple characters. There are long parts describing in a big detail a layout of two small towns separated by the river and, more importantly, by demographics of inhabitants. I could not keep track of all the streets and kept asking myself why, if they were supposed to be so important, not to simply draw a map? Then I got introduced to many protagonists several of them the members of two competing youth gangs; the kids of Mexican origin and white kids. Again, I got lost in who is who and the problems of the young people and other characters felt like “carbon –copied“ from other books. Then, finally, aliens invade and there are several bloody and gory encounters between them and local human population. The first one or two of them were interesting but repeated for the 10-th and 20-th time in different variations they became boring (and made me skipping paragraph again). In the last 10% of the book the new things start happening but by then I was so tired I could not get involved in any of the action. On top of that there are several annoying inconsistencies in psychological makeup and in behavior of both; humans and aliens. It was just a two star reading experience for me but I believe this book may be much more appealing to the fans of gory horror and/or zombies’-like scenes. As for me, I do not give up on this author, I just need to choose other book of his (the one that is more like “Boys Live”, “Gone South”, “Speaks the Nightbird” or even “Mystery Walk”). 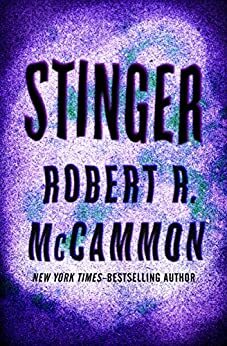 While Robert McCammon is one of my favorite authors (I worshiped the thrilling spy/werewolf tale "The Wolf's Hour" and adore the classic "Boy's Life" so much that I re-read it this year), I found "Stinger" to be a bit pedestrian. Like a wan Stephen King substitute, the story tells the tale of an alien crash-landing in small Inferno, Texas and what happens to the townspeople when faced with such a test; in essence, it's good vs. evil in its broadest terms. I appreciated much of the alien world-building and there's gore aplenty, but it didn't scare me in true King fashion like the master's "It" and "The Tommyknockers." So while McCammon's book isn't quite sting-worthy, I still enjoyed the ride.